As you might imagine, you get a great deal of perks working at a school like Whitgift: aside from obviously teaching such wonderful boys, there is the opportunity to watch near professional dramatic and musical productions; see future Lions rugby players, England cricketers and Premier League footballers nurture their talents; you even get the opportunity to take a stroll amongst peacocks, wallabies and flamingos. At Whitgift, you come to expect the extraordinary, but despite this, I was still taken aback on Monday 22nd May when a cursory glance at my emails revealed the fact that none other than the Australian cricket team were ‘popping in’ for the day to make use of the school’s facilities to aid their preparation for the upcoming ICC Champions Trophy (the training obviously was not enough to help them against the might of England, but that is another matter!) Both boys and staff were allowed to go out and watch them on North Field, and some of the A-team players were allowed to train with them as if it were just a run-of-the mill school practice… Starc bowls to Warner, Warner goes for the 6 but is caught on the boundary by Whitgift U15 captain Heaver… before you knew it, they were gone, having disappeared off into the Croydon sunset; just another Whitgift Monday. Such experiences might seem somewhat surreal in most schools, but on the Whitgift Field of Dreams, anything can happen! Maybe the reason the Australian cricket team decided to make use of our facilities was that they thought they might learn something, seeing as how the majority of our teams have made it to this late stage of the season without having lost a match. Indeed, the U11, 12, 14 and 15 A teams are all unbeaten as I write this, with the latter having made it through to the quarter finals of both the ESCA T20 and NatWest County Cup tournaments. Whitgift golf is also thriving, with the first team recently competing in the annual Independent Schools Golf Association (ISGA) national final, held at Royal St George’s and Prince’s Golf Clubs, in Sandwich, Kent. Lower Sixth Form pupil, Alfie Fox, performed superbly to win the individual tournament, with a gross total of 136, 6 under par for the two rounds. Four shots behind him, in second place, was Harry Plowman Ollington. Upper Sixth Former, Harvey Byers, brought Whitgift’s tally of players to three in the top 6. To top off the competition, which took place on the 23-24 April, Whitgift won the team event with a score of 276 – 9 and 18 points ahead of runners-up Birkdale and Millfield respectively. In football, both the U11 and U13 sides reached the national finals of the ISFA and ESFA competitions respectively. Unfortunately, neither team were able to claim the spoils on the day, with the U11s losing 2 – 0 to St George’s and the U13s taking Thomas Telford School all the way to a penalty shoot-out, before being pipped to the post 5 – 4. Through the wonders of modern technology, over two hundred boys were able to watch the U13 action unfurl live, as it was streamed to a big screen in Big School. This was a fantastic show of school spirit and hopefully something to be repeated in the future. On Friday 28 April, Whitgift Combined Cadet Force was inspected by Major Nick Martin, of the Royal Military Academy Sandhurst. Having inspected the Guard of Honour and the Corps of Drums, he then observed a range of training activities, including kayaking, air rifle shooting, the climbing wall, the obstacle course, laser shot gun shooting, the RAF flight simulator and Emergency First Aid. There was also an arena display with tug of war and obstacle course race finals, a very spirited Platoon Attack display and Beating Retreat by the Corps of Drums. Many Old Whitgiftians came back to support the AGI, including alumni serving in the Regular Armed Forces. Major Martin praised the enthusiasm of the cadets, the vast array of activities and the excellent support from staff and Old Whitgiftians. He was also impressed with the success of the partnerships with Thomas More Catholic School and St Andrew’s CE School. One of the Old Whitgiftians who came back for the AGI was none other than the front cover star of the last WA Newsletter, Dr Ollie Stoten, who was part of a six-man team of British Army Reserves who skied unsupported to the geographic South Pole in 2016. He also returned to the school to address the First Form in an engaging talk about his polar exploits. Indeed, he was one of a number of special guest speakers to visit Whitgift during Trinity term to talk to the students as part of the Academic Enrichment Lecture series. Jo Ruxton, producer of the recently released documentary, ‘A Plastic Ocean’ spoke about her work with a number of Upper School students, and then gave a lively talk featuring clips from the film, encouraging pupils to rethink our consumer relationship with plastic packaging. Representatives from the research company, Benevolent AI, also addressed some Upper School boys, revealing some of the fascinating secrets behind the use of artificial intelligence in the development of drugs. Whitgift Chaplain, Reverend Alan Bayes, is scheduled to speak about the sometimes troubled relationship between science and religion, and last but not least, Aardman Animations will provide the final talk of the year, after exams. On the music front, the school sent four boys to compete in an International Music Competition in Gyor, Hungary, at the end of April. Upper Third student, Marlon Barrios Araya, gained first place in his category, performing with a maturity well beyond his years, and Uriel Vilchez Meza, also in the Upper Third, achieved a respectable third place. Maximilian Sitter, a Lower Fifth student, went on to gain second place in his category, capturing the style perfectly and demonstrating his incredible progress as both a performer and accomplished violinist. Sixth Form student, Andrei Mamarã, performed with confidence and polish to top off the Whitgift winnings, being awarded the coveted first place in his category. Adjudicators further praised the outstanding ability of Whitgift’s Accompanist, Mr Lane, who provided exceptional support throughout all the pieces. And finally, despite this being an incredibly busy time at the school (when isn’t? 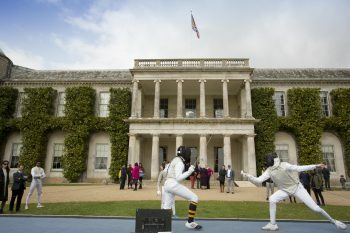 ), we still found time for some cultural and artistic celebrations in our East meets West Arts day which took place at the end of April in the magnificent surroundings of Goodwood House. Scenes from Summer’s Last Will and Testament, performed by current students and Old Whitgiftians, were particularly well suited to the venue’s dramatic setting and traditional décor. Musical entertainment throughout the afternoon included performances from the Whitgift Brass Ensemble and Whitgift Symphony Orchestra, as well as solo pieces. The Whitgift Choristers further impressed visitors with a repertoire from their recent Tudor CD recording. Music journalist and acclaimed author, Jessica Duchen, also joined Whitgift for the day to introduce her latest novel, Ghost Variations. Visitors were able to try their hand at mastering the art of origami, with students at the ready to help them perfect paper cranes and peacocks. The stunning Senbazuru tree was a special highlight, adorned with 1,000 cranes crafted by the Whitgift Japanese Club. A life-size peacock sculpture, created by undergraduate placement student, Adam Sykes, was on display in the Front Hall – this one skilfully constructed from metal rather than paper! Outdoor entertainment was provided by the Whitgift Corps of Drums and demonstrations by Whitgift fencers. Along with croquet, Tim Trodd, Whitgift’s resident PGA professional, was also on hand to share golf tips with visitors, encouraging participation from all ages in the chipping competition (the youngest winner being just two years old!). Last but not least, the day ended on a high, figuratively and literally, as Ultimate High’s elite pilot, Mark Greenfield, took to the sky for a spectacular air display, wowing everyone with his dare-devil tumbles. Whitgift would like to thank all those who helped make the day such a triumph, and we look forward to returning to Goodwood House in the future.